Nathaniel Eckstrom is an illustrator and the author of Connected. 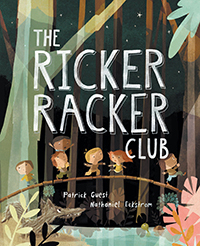 To be in the Ricker Racker Club you have to be brave. You have to be kind. You have to not be a girl . . . but some people are better than others at being both kind and brave. Talented emerging book-creators Patrick Guest and Nathaniel Eckstrom unite in this lively story about silly rules and even sillier situations. They take an affectionate look at the foibles of childhood politics, and in the process draw pertinent and universal—though delightfully understated—conclusions about adult life.